I had some 30's repro fabric that was already cut into 2 1/2" x 6 1/2" rectangles left over from another project. 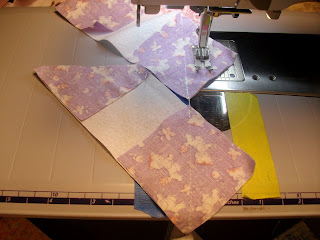 I used the rectangle for the center and cut some remaining strips into 2 1/2" square and sewed them onto white rectangles. Here are just a few of the Spool blocks that I've made. close up of some of the fabric. this one is a Michael Miller fabric...love the circles. 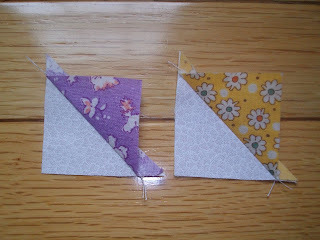 cut between each stitching line and you will have a bucket of half square triangle waiting to be squared up. These will square up at 1 1/2". 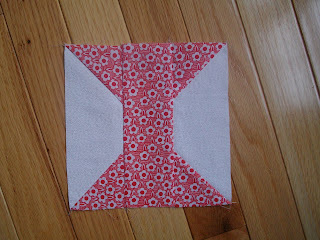 Great for pinwheels or for the border. Maybe just a little mini!! 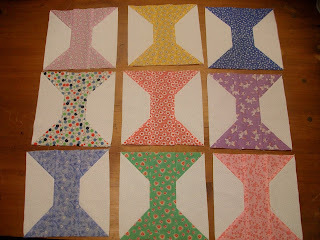 Here is the pile of the 3 pieces for each block just waiting to be sewn together. I'll show more when I get the rest done and square up the half square triangles. Karen...I love your tip on the triangles. I really like the alternating look best! 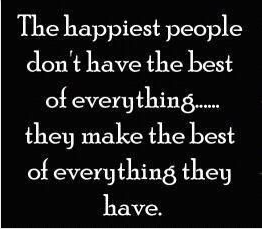 Have a wonderful evening! I really like the alternating blocks. 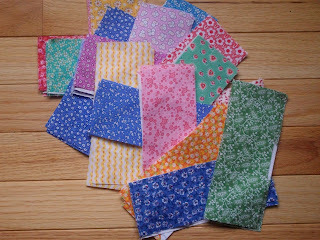 Such pretty fabric, its going to be a lovely quilt. 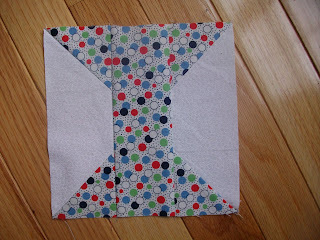 You sure did sew girl, of course I am a big fan of 1930's fabric, and just love the block, also what a super great tip for using the left over fabric, thanks. My choice would be picture one, alternating I think it gives it more interest. How cute! 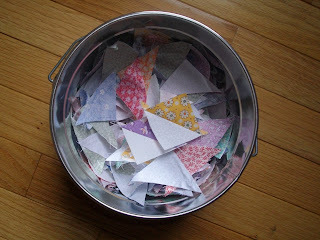 And what a great idea to get 'more' out of your fabric and hard work! I think I like the alternating spools better. The blocks are lovely - how big are they? 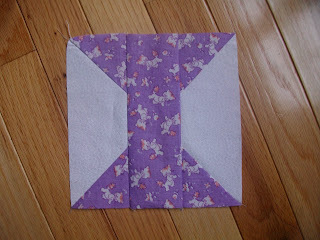 I can see from the close up that the block would be easy and fun to piece. Very cute...I am loving the first picture. Great fabrics. Great tip. Better then drawing a line everytime. Cute, cute blocks...alternating wins hands down. I like them alternating better. It has more interest. Beautiful blocks. So glad you got to sew!!! 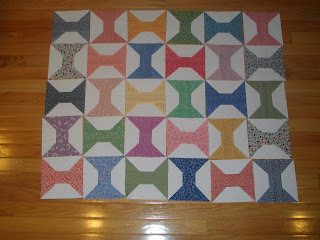 And I love the spool blocks...I'd definitely set them like in the first picture! I like the alternating setting, more interesting and then the fabrics each stand on their own. thanks for sharing! I like the alternating...and I love the Tool Time tip. How cute! I love this spool pattern! Good choice of fabrics! I forgot to answer your question! I prefer the alternating blocks. I really like the alternating blocks...BUT I think the straight-up version would be really cute with some sashing between and maybe little 9-patch mini-blocks at the corners... Any way you decide, it's going to be cute and awesome! Veerryyy nice! I like the alternating blocks, actually. Kind of.. a bit more whimsical I guess... :) Great job! I looooooooove your spools! These fabrics are some of my favorites. Love your colorful spools. Yes, alternating is best.